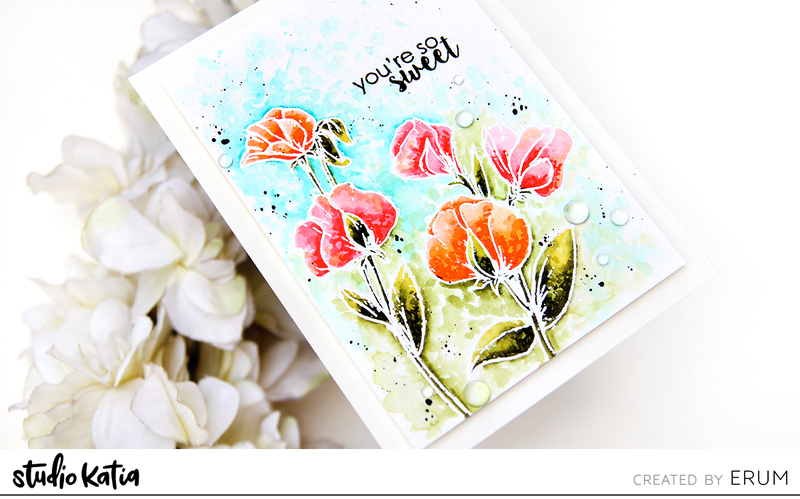 I have a watercolour card to share today featuring the You’re So Sweet Stamp Set. I heat embossed the images in white on watercolour cardstock. I used watercolour brush markers to colour the images and also the background. First, I applied a colour wash of one colour on the image and then let it dry a bit. Then I went in again to add more detail by adding concentrated pigment. This is easy watercolouring. Just by adding a darker pigment, you end up with good detail on the image. For the background, I just used water and diluted pigment and added it as stippling. Since I had a lot of water on my brush, the stippling was more splotchy than dotted. Once the watercolour was dry, I added fine black paint splatters and stamped the sentiment. To finish, I adhered several clear dots. That is all from my side today, I hope you liked my card! It’s Dana here and I’m sharing no line watercoloring card featuring some of our new release today. Let’s get started! I began by stamping Studio Katia Aloha Stamp Set images using Antique Linen Distress Ink onto hot pressed watercolor paper. I die cut them out using Coordinating Dies and watercolored them using paint brush. After it dried, I applied Nuvo Crystal Drops Gloss Simply White and Dandelion Yellow to each stamens. Next, I created 3 1/2 X 8 1/2 kraft card base and trimmed down bistol paper to smaller size than card base. I lightly sponged each corner using Bundled Sage and Worn Lipstick Distress Oxide Inks. 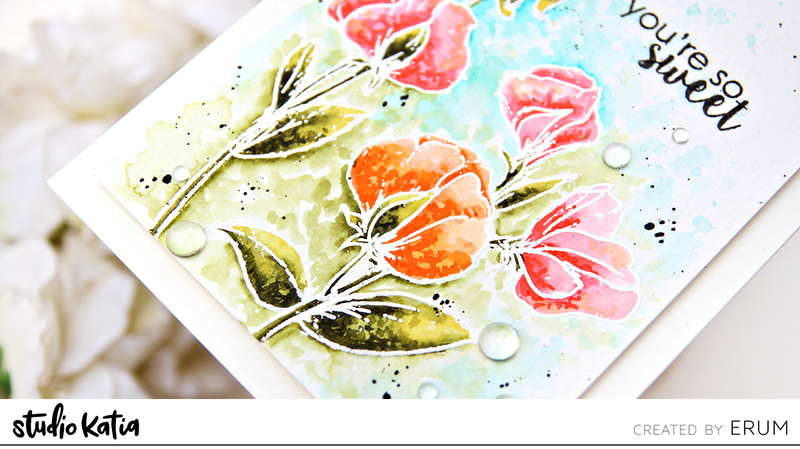 I then stenciled both sides with same inks using Studio Katia Grid Stencil. For sentiment, I die cut two bigger ones from black card stock using Studio Katia Best Ever Coordinating Dies. Then, I white heat embossed a *mom* from Studio Katia Best Ever Stamp Set onto a piece of black paper. I die cut it using Studio Katia Labels Coordinating Dies. To finish, I popped up floral images using foam tape and mounted others as shown.